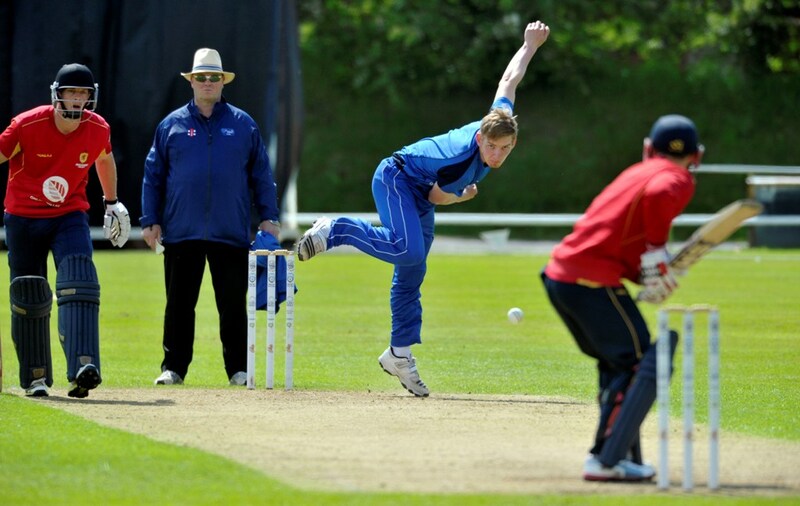 Dumfries opening bowler Niall Alexander was in action last week with the Scotland Development XI on their trip to Yorkshire. There the Scotland side played a 2-day fixture against the county’s Yorkshire Academy team. The young side, which consisted of a number of Scotland’s up-and-coming cricketers, registered an impressive win against Yorkshire’s next crop of Joe Roots and gained some valuable multi-day cricket experience. The Scots set a good total of 296 all out on the first day with Budge 115 not out and Sole hitting 92. Then the opening pair of Alexander and Neill reduced the Yorkshire side to 35 for 5 with Alexander taking two wickets. He then came back to send the stumps flying with the ninth wicket as the home side were dismissed for just 119. Chris McBride was to the fore again for Cumbria U17s with a score of 37 and a couple of wickets as they won their Royal London Championship Division with their performance against Leicestershire U17s after a first innings total of 264 surpassed that of the home side of 170 all out. In the Western Premier League on Saturday, the Stafforce Recruitment Dumfries fixture at East Kilbride was cancelled with the ground not playable. All the scheduled fixtures in the league ended up as abandoned due to rain so the league positions remain unchanged. In the Western Premier Reserve League, Dumfries 2nds, Nunholm, beat East Kilbride 2nds, Torrance House, at home by 71 runs to move up into third place. Nunholm scored 156 for 8 with Davie Davidson the top scorer with 41, aided by contributions of 29 by Adam Elliott, 25 from Cammie Telfer and James Cox’s 17 not out. Torrance House were then all out for 85 with the J&E Shepherd Man of the Match, Stuart Alexander, and Chris McCutcheon and Jerry Goodin all taking three wickets apiece. The Dumfries Sunday XI won their contest at Kinmount by five wickets chasing 87 with two batsmen dominating each innings; Ben Flack with 48 not out for the home side and the Brian Boyes Electrical Dumfries Man of the Match, Gordon Lyburn, who scored 41 not out. Holiday Junior Cricket: Dumfries Cricket Club’s Junior Coaching takes place at Dumfries Sports Club on Mondays over the holidays, 6:15-8, for boys and girls, P4 to S1. Beginners are welcome. For details contact Trefor Williams (01387 256455), or the club on dumfriescricketclub@gmail.com, 07799 856094, or see www.dumfriescricketclub.co.uk, Facebook(/dumfriescricketclub), or Twitter(@dumfriescricket). In the Western Premier League this Saturday, mid-table Stafforce Dumfries are back in action at third placed Ferguslie and, also sitting in third, Nunholm play Meikleriggs at home in the Reserve League. On Sunday, Dumfries compete at the Murgitroyd Scottish Twenty20 Finals day in Glasgow where they take on Poloc, on their home turf, in the morning semi-final.